Alessandro says I sometimes scare him. Not because of anything I do (although my clumsiness can reach scary heights). But because of what I dream. I often have incredibly vivid dreams and like telling him about my latest nocturnal adventures while we share our first cup of coffee in the morning. The other day I dreamt I was hunting for miniature Christmas trees with my mum, in a shopping centre which does not exist in real life but which I frequent on a fairly regular basis on my nocturnal adventures (mainly because they have this amazing toy store / cake decorating utensil store on the top floor – sadly, I don’t always make it up there before I wake up). Unsatisfied with the rather meagre offering of miniature Christmas trees (no wonder, it was an after-Christmas sale to get rid of remaining stock), we trundled on, browsing the shops here and there and headed towards the upper levels as I wanted to finally show my mum that favourite store of mine. It took us a while to get there as I got into an argument with one of the shopping centre’s security guards (who, like all the security guards, was Japanese – although we were not in Japan). Eventually, the incessant ringing of my alarm woke me up. So while not a terribly adventurous dream, it boggles my mind why I keep on dreaming about this non-existent shopping centre or why I would dream about an argument with a shopping centre security guard, let alone a Japanese one (and I won’t even go into how part of the dream also featured my niece Chiara, a first year university student who suddenly turned up as a 2 year-old toddler). I am no one to read anything into dreams but I do find it fascinating what happens when we sleep, or maybe rather, how we perceive what our brains process at night. And while this recipe has nothing to do with Japanese security guards or non-existent shopping centres, I finally perfected the recipe for this tamarind curd the morning after this latest nocturnal adventure so there is some link at least between the two. 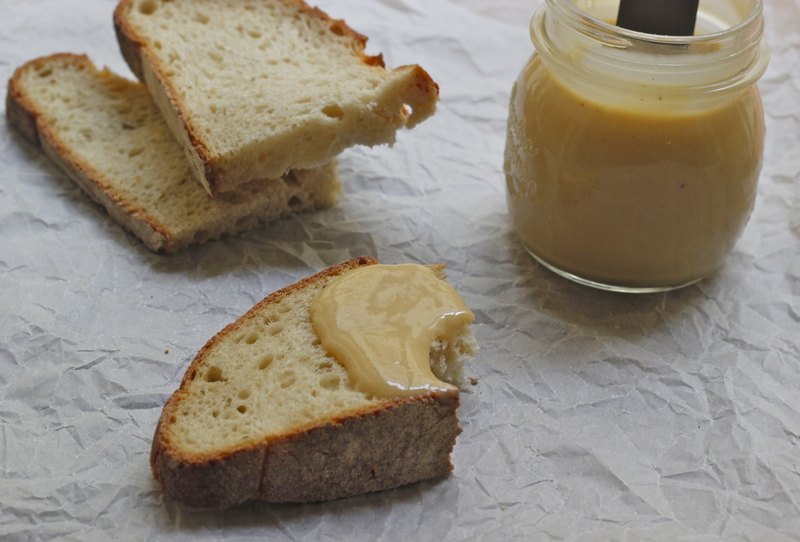 While the word curd sounds as inviting as ‘moist’, a homemade curd is a wonderful addition to the breakfast table. And while lemon curd might be the most common type of curd, the basic recipe is easily adjusted to substitute the juice of other citrus fruit or the juice of tart fruits like cranberries, rhubarb or indeed tamarind. While the pulp of tamarind is as mouth-puckeringly tart as lemon juice, add some sugar to it and other notes come forward, mellow notes, not unlike those of dried fruits like dates and raisins. Note: This makes one small jar (ca. 250ml). 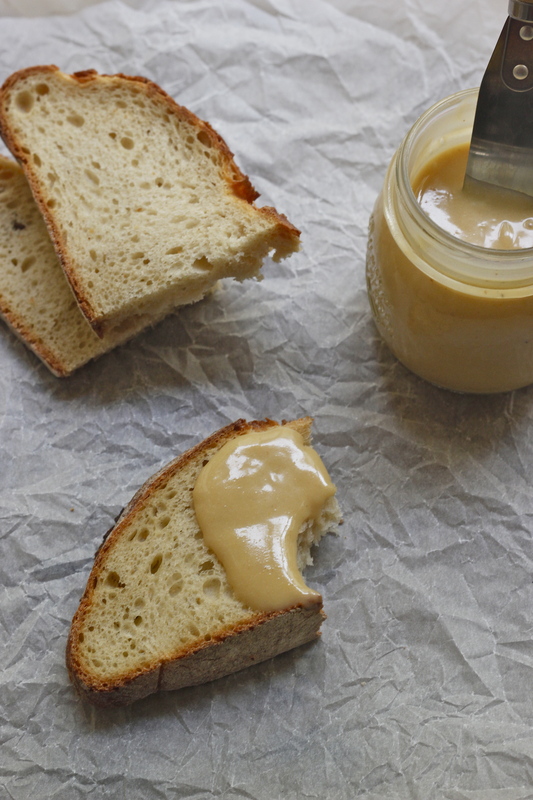 You could certainly make a larger batch but bear in mind that homemade curd, even stored in the fridge, has a limited shelf life so unless you are planning on giving jars away or bathing in tamarind curd for the foreseeable future, just stick to 1-2 jars. 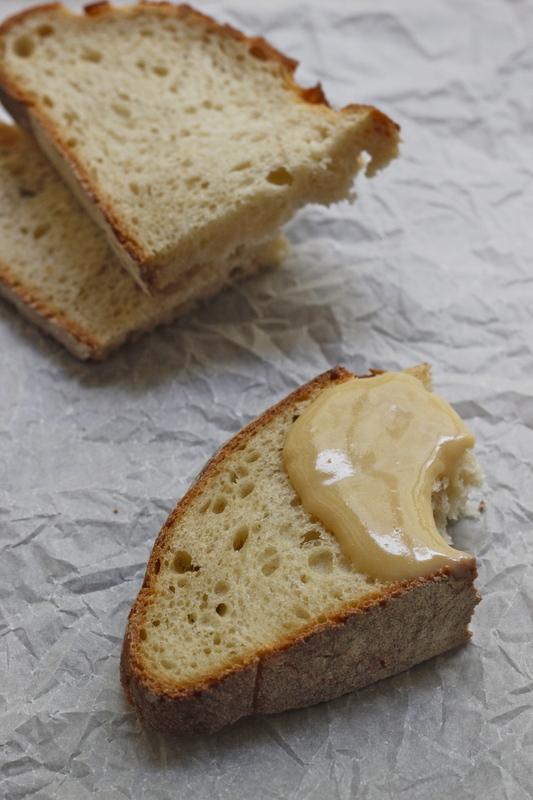 Like all curds, this tamarind version is wonderful on a piece of toast, a scone, stirred into a bowl of yoghurt or porridge but would also be lovely sandwiched between two layers of your favourite cake (I am thinking it would be particularly good spread between two layers of a coconut and nutmeg cake like this one or a date-sweetened coffee and cashew nut cake). 1. In a medium-sized metal bowl whisk together the tamarind juice, muscovado sugar, pinch of salt and eggs. Place metal bowl over a saucepan containing simmering water (making sure the bowl does not tough the water). 2. Whisking continuously, heat mixture until it is thick enough to coat the back of a spoon. Turn off the heat and whisk in the cubed butter until the mixture is homogenous. Pour curd into a small jam jar, screw on the lid and place in the fridge for a couple of hours to set. *To make the tamarind juice soak 45g tamarind pulp in 90g hot water for 30 minutes. Strain pressing on the pulp to release all the water and measure out 90ml (any extra juice can be used for salad dressings like lemon juice or added to a glass of sparkling water for a refreshing and slightly acidic drink). Ha, I always have crazy dreams! I talk a lot in my sleep too, apparently I have done since I was little… Anyway, glad you slept well enough to come up with this deliciousness the next day, I’m completely intrigued. Where do you buy your tamarind from? Glad I am not alone – my boyfriend rarely remembers his dreams so I always feel a bit like a freak. You can either buy fresh tamarind (best bet are stores selling South American products or Asian grocers) or buy just the flesh (with or without seeds) – I bought the latter in an international delicatessen here in Rome. things i need in my life: this.